One summer’s day in 1995, our Brand Manager Anoop Anchal declared to his then-girlfriend Fiona that he had an idea. “Men’s custom business shirts,” he proclaimed. “Yep, cool,” Fiona replied, with a confused look on her face. “Men can’t get shirts to fit them, especially when they are tall. We need to open a shirt shop,” he replied. Nine years later, after many conversations about shirts, a backpacking holiday, a wedding, and buying trips to Italy, that shirt shop became a reality. In 2004, Anoop and Fiona opened Shirt Studio in Brisbane’s Tattersalls’ Arcade. Fiona quit her job as a marketing executive to build the business while Anoop continued working as a pharmaceuticals sales manager. Their range included beautifully tailored shirts for both men and women, and they had great success – after two years Anoop joined the business full time, and they opened three more stores and an online store within four years. Retail fashion was at its peak, and corporate uniforms were crying out for attention. Catalogue products and bulk orders meant uniforms were ill-fitting and unstylish. Understanding how important uniforms could be as a brand tool, Anoop and Fiona saw another gap in the market and decided to expand into producing custom shirt uniforms. In 2007 Anoop and Fiona launched Shirt Studio Corporate, a shirt uniform company that did things differently. 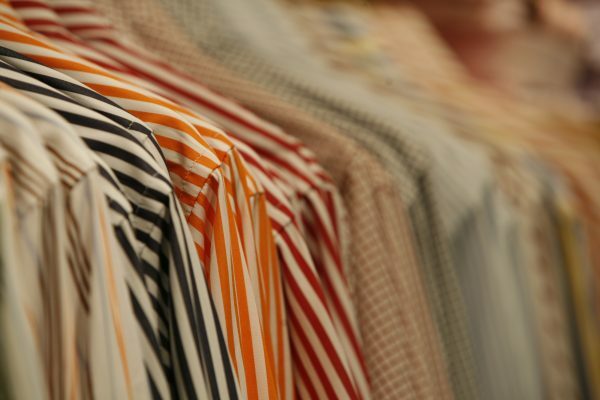 They made retail-quality shirting accessible for uniform buyers and made custom-designing your company’s shirt uniform possible for the first time. The initial range was the biggest of any uniform company at the time – with more than 60 shirt fabrics and 500 custom combinations available, the custom shirt revolution had begun. Of course, it didn’t end there – clients loved the custom shirt uniform range and wanted other products – suits, polos, jackets, chinos, t-shirts and more – to complete their corporate look. So as the uniform business grew, the retail business was wound down. In March 2014 the focus shifted entirely to custom uniforms and building a product range that would allow customers to create a complete uniform wardrobe. The only constant in life is change. The shift in focus from shirts to complete uniforms made a name change inevitable, so in early 2019 we gently closed the 15 year-old door on Shirt Studio Corporate and opened up to the more expansive world The Uniform Edit can offer our team and our clients. Change may be constant, but one thing that won’t change is our commitment. The business is still driven by our founders, Anoop and Fiona Anchal, and they are as passionate as ever about bringing something special to the Australian marketplace and partnering with clients to bring their ideas to life. With the support of an equally dedicated, experienced and capable team, The Uniform Edit is a formidable force.